Cloud Storage is UKCloud's object storage solution based on Dell EMC Elastic Cloud Storage (ECS). Although you'll mostly interact with Cloud Storage through the API, you can create new Cloud Storage users in the UKCloud Portal. The Users tab lists the different user IDs associated with the namespace. 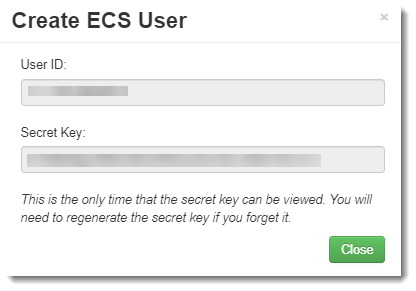 In the Create ECS User dialog box, make a note of the User ID and Secret Key and then click Close. After you close this dialog box, you will not be able to see the secret key again in the UKCloud Portal. If you do not make a note of the secret key or if you forget or lose it, you will need to reset it again. For information about how to do this, see How to reset your Cloud Storage secret key.